They’ve been riding motorbikes for over ten years and aren't afraid of any terrain. Defying clichés, they travel across Europe to discover new landscapes and populations. Portrait of a woman who can't be stopped. Light on her feet, her gesture is slow and affectionate. She slides her hand across the seat of her black 12,100 R that she bought 13 years ago. "I can't get rid of it, I lived through too many things with it," says Sophie, a sporty, middle-aged woman who manages her time between her thesis on women in the Camargue's herds, her job as a researcher in a big media company and her passion for motorbikes. After three inexplicable breakdowns on the highway, Sophie's BMW which is counting 130,000 km is going to go into service. Unfortunately, the researcher cannot count on the ride that has accompanied her throughout Europe. Replaced but not forgotten, the 12,100 R now shares Sophie with another bike: a Triumph. 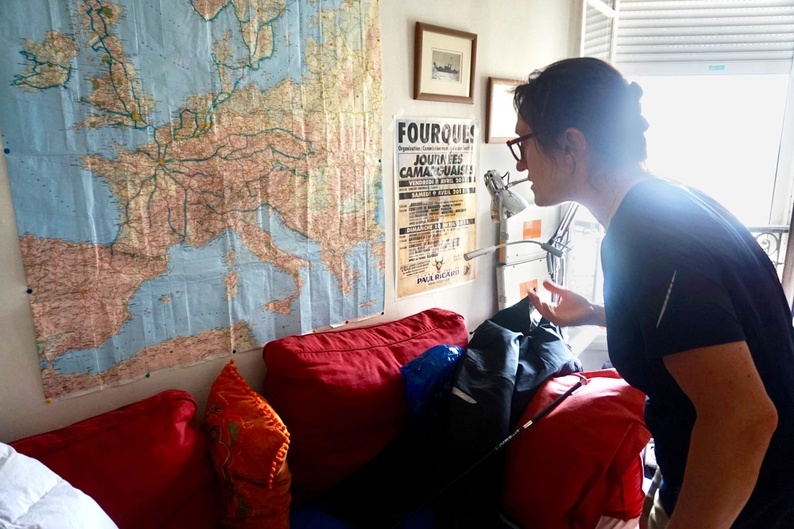 "With the oral examination of my thesis coming up in ten days, I had to prepare my trip in advance," she explains, as she looks at the metal boxes lying around her living room in Paris' 14th arrondissement. Small nets for clothes, laundry detergent, crockery and a tent are spilling out of her bags. On the 7th of July, Sophie and her friend Caroline mounted their bikes for a month-long trip across Europe. "Since 2003, I've been discovering a new European country every year. It's become a necessity, I wait impatiently for that moment [every year]," Sophie explains. This year, the duo travelled for a week to Tallinn in Estonia to meet up with the girls for the WIMA (Women’s International Motorcycle Association), an organisation created in the United States in 1950. Sophie's passion for motorbikes began in her early teenage years. "I started thanks to my older sister and my uncle. Bicycle, moped... as far as I can remember, I've always been on two wheels," she recounts. At 20 years old, with her motorcycle license in her pocket, she went from her native Camargue to Paris: "It was a real nightmare. From 1991 to 2003, I only used my bike as a way to commute, not to travel." Everything started to make sense when she travelled to Ireland alone. She stumbled upon the girls from WIMA, who invited her to join them for weeks of travelling through Europe. "I followed them as if they were friends, not family," she writes on her blog, "Some women came alone, others even travalled with their husbands and children. It's a space with no limits, where differences are erased, where masks are dropped and where tolerance rules." For this researcher, whose thesis title is "Do it like a man while keeping your femininity," being a biker is not a feminist act. Of course, riding a motorbike is 'manly' but it's mostly just unusual for a women, Sophie thinks, underlining the physical dangers of this masculine activity. Laurie, a young biker who also travels around Europe, considers motobiking not "as a statement, but a passion. It's a great way of experiencing things the way they are: in direct contact with the rain, the wind, people..."
Like a trophy above her bed, Sophie has pinned The Motorcycle Diaries movie poster – which tells the story of how Che Guevara and Alberto Granado crossed Latin America in 1952. The poster inspires Sophie. The most memorable of her trips in Europe are Croatia and the Scandinavian countries: "We were dying of heat in Dubrovnik, but the crystalline water was beautiful. If I were to go back somewhere it would be the Nordic countries. There are so few people, it's hostile, cold, spacious and far away." Still, trips across Europe are not the most unfamiliar ground the biker can imagine crossing. "We're still in the Western world, it's rare to drive on unpaved roads like in other parts of the world," she explains. On the wall of her living room, a blue web of yarn stretches across a map of Europe. Since the age of 17, Sophie has been tracing new roads. "A month on a motorbike is not that easy. We're super exhausted at the end, we just want to sleep on a mattress. It has happened before that I cross over the French border and start crying from relief," she admits. She recalls a particular moment in Norway, three years ago, when she had to face storms and icy winds. "I couldn't even hold my 240 kg bike. Those are very hard but very powerful moments," she concludes. Next year, Sophie and her bike might leave Europe for the first time. "Why not Mongolia..." she whispers to herself.